Similar to one-to-one association, many-to-one association supports a source entity having a reference of another entity (the target entity), but unlike one-to-one association, many-to-one association also supports multiple instances of the source entity sharing a single target entity instance. To establish this relationship, @ManyToOne annotation is used in the source entity class. It is placed on the filed/property of the target entity. On the target side, we don't need to use any relational annotation unless it's a bidirectional association. The table corresponding to the source entity, is the child-table which has a foreign key column, whereas the table corresponding to the target entity, is the parent table which has the corresponding primary key column. 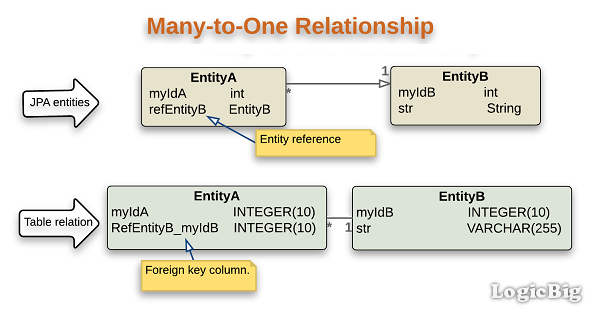 The foreign key column in the child-table must not be unique so it can be populated with a single parent's primary key multiple times, thus forming a many to one relationship. Just like @OneToOne, we can use @JoinColumn along with @ManyToOne to specify a different foreign key column name. We are going to populate multiple instances of source EntityA with a single instance of target EntityB.